The youngest baby boomers turned 50 last year. With an age range of 51 to 69 years old and numbering nearly 75 million, they are expected to live longer than any previous generation. Committed to healthy aging like never before, older adults have become a fast-growing segment of the fitness population. The University of Delaware’s new Senior Fitness Training Specialist Certificate was created with a variety of fitness and health care professionals in mind, preparing them to work as personal fitness trainers to clients over age 55. The program will also appeal to fitness enthusiasts seeking a rewarding career change or side career in helping others achieve their health and fitness goals. The 15-week certificate program takes place at Hockessin Athletic Club and combines classroom instruction with hands-on learning in a state-of-the-art fitness facility. The curriculum includes a detailed foundation in exercise science; anatomy and physiology; and health, medical and exercise considerations for older adults. There are no academic prerequisites to enroll in the program. With over 20 years in the field, program creator and lead faculty member Jim Menz is a certified strength and conditioning specialist, a corrective exercise specialist, and holds a master’s degree in exercise science and postgraduate certificate in rehabilitative science. Program faculty are certified, practicing professionals in the fields of nursing, physical therapy, personal fitness training and exercise science. 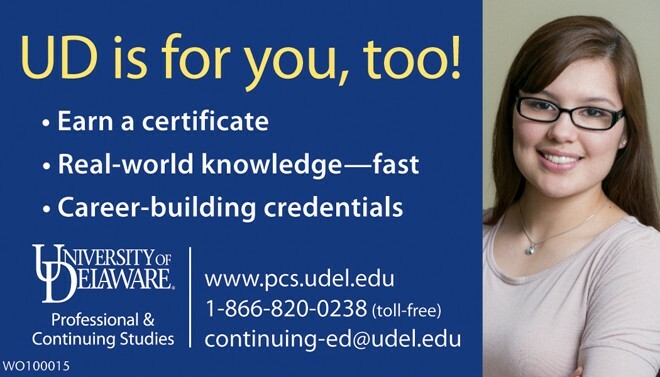 This noncredit program is offered through the UD’s Division of Professional and Continuing Studies. For more information or to register for this program, visit www.pcs.udel.edu/seniorfitness/, write to continuing-ed@udel.edu or call 302-831-7600 or 1-866-820-0238.